It might not be as glamorous as Cannes or as cool as Sundance, but the Los Angeles Film Festival has just as much to offer as its larger counterparts. Between high-profile premieres of blockbuster films, international competition entries and some of the most exciting indies around all premiering at LAFF every year, there’s plenty to pay attention to. But if you were unfortunate enough to let the this year’s fest — which ran from June 11 to 19 — we’ve got you covered with a rundown of the most talked-about films to premiere at LAFF, and what the critics are saying about them. Now you can make all of your friends think you’re cooler than you actually are. The Amy Poehler/Paul Rudd romantic comedy you’ve been waiting for is less about the relationship between the central couple, Joel (Rudd) and Molly (Poehler), and more about skewering every last trope of the genre. Written and directed by Wet Hot American Summer’s David Wain, the film lovingly parodies the traits, characters, conversations, and comically large apartments that appear in every rom com ever made, while allowing two funny, good looking people to fall in love in an entertaining way. A small town crime drama set in Cut Bank, Montana that centers on a former high school football star (Liam Hemsworth) desperate to find a way out of his town. After he accidentally films the murder of the town mailman, he is offered a reward that would give him enough money to leave for good, but things aren’t a simple as they seem, and he finds himself caught in a tangled web of deception and danger. 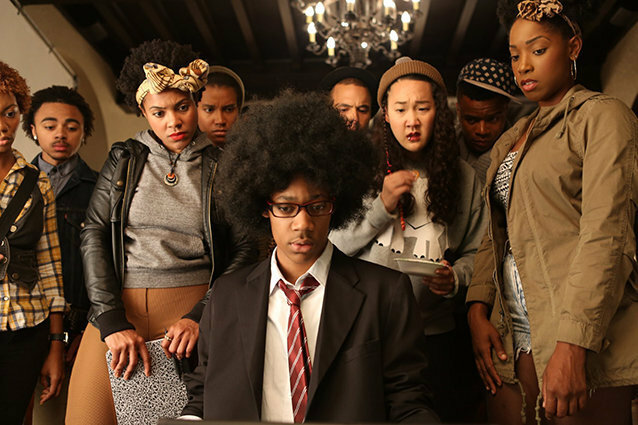 A satire of college movies that tackles race relations and privilege in society, Dear White People follows four students as an Ivy League university — golden boy Troy (Brandon P. Bell), activist radio host Samantha (Tessa Thompson), Colendra “Coco” Conners (Teyona Parris), who has dreams of being a reality TV star, and shy misfit Lionel Higgins (Tyler James Williams) — after a planned “African American”-themed party thrown by a group of white students starts a riot on campus. With a cast full of comedians and sitcom alums, The Last Time You Had Fun puts a grown-up twist on the standard “wild night out” comedy. After Ida (Eliza Coupe) forces her sister Alison (Mary Elizabeth Ellis) to blow off some steam with her, they find themselves bickering and partying with Clark (Kyle Bornheimer) and the sweatpants-clad Will (Demetri Martin), as the four of them attempt to have the most fun that four older, dysfunctional adults could possibly have.